At the most recent Google earnings call, Sergey Brin said some interesting things regarding the ads from search results pages. Google tries to reduce the number of ads that are displayed and the number of queries that show ads as it improves the targeting and the ads are more effective. We try to reduce our coverage at the same time as improving the monetization. But clearly that's not the ideal strategy indefinitely, because we don't want to end up with no ads. And in fact from a quality point of view, we now find our ads are a significant addition quality-wise to our page. They are just a very important source of information. (...) We're all the time running experiments. We run some people without any ads at all, and we know that our ads add value so we know that we're happy about having them. 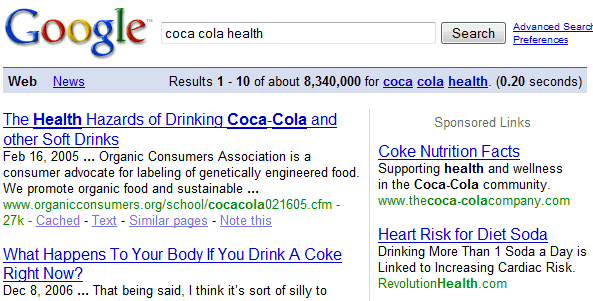 Jonathan Rosenberg quoted Larry Page, who "often says that we'd be best off if we just showed one ad, the perfect ad". Showing ads that are relevant to the context makes the sponsored links section an alternative to the list of search results, but I wouldn't call some paid links "a very important source of information". Most ads try to convince people to buy a product or a service and to achieve this they may use manipulation or misleading messages. Moore's film [Sicko] portrays the industry as money and marketing driven, and fails to show healthcare's interest in patient well-being and care. Sound familiar? Of course. The healthcare industry is no stranger to negative press. A drug may be a blockbuster one day and tolled as a public health concern the next. (...) Many of our clients face these issues; companies come to us hoping we can help them better manage their reputations through Get the Facts or issue management campaigns. (...) We can place text ads, video ads, and rich media ads in paid search results or in relevant websites within our ever-expanding content network. Whatever the problem, Google can act as a platform for educating the public and promoting your message. Advertisers have an agenda and they're rarely objective. They provide facts that are difficult to verify and they rarely support their claims. AdWords has a big list of guidelines that includes supporting competitive claims, third party verification of the claims and an accurate representation of a product, but not all the ads respect these guidelines. In an interview from 2004, Sergey Brin said that Google's ads "aren't distracting; they're helpful. (...) We know that when people are looking for commercial things, they use the ads. They know they're ads and they know they're just commercial, yet they use them." Did you use Google's ads as a source of information? You could check your ad history to see if the ads that attracted your attention supported their claims and offered useful information. I can vouch that from the early early days we've thought of ads as searching over a different type of information. As a result, we've been focused on making sure that ads are as useful/helpful as possible for that reason. Often the best information in an ad is that you can buy the thing you want from that merchant, or that the merchant has policies (like free shipping) that you prefer. For queries with commercial intent, I think that information is quite useful. I were always enjoying browsing with Adblock enabled to clear my web view, until recently it felt kind of lonely without most of those promotion. It is strange to feel isolated without ads, but personally it is true. I'd admit that ads are really an important part of the social life and I cannot dare without all of them. Then I decided to disable adblock on google.com and techcruch and a few other, all of my favourate sites without intrusive ads. And I blieve I will certainly enable it once the ads on those sites become intrusive. I use the ads all the time. If I want to find out more about a particular product I've seen for sale, I'll browse the ads for product descriptions etc.